When it comes to finding holiday gems in the world, you won’t find too many more beautiful than Agadir in Morocco. If you’re looking for a city designed for visitors, the spacious streets and bright white buildings will welcome you with open arms. Over the years, Agadir has steadily become more and more popular, and perhaps this is helped by the 300 days of sunshine it enjoys. However, the air isn’t so thick that you can’t enjoy yourself because the coastal breeze of the Atlantic will feel amazing as it caresses your face. Even in the winter, you can leave your scarf at home while travelling around the stunning natural sights Agadir has to offer. Today, we’re going to dig deeper into this amazing city so, by the end, we almost guarantee you’ll have other tabs open looking at flights and hotels! Whilst on the theme of hotels, we should note that you’ll have plenty of choices. As mentioned previously, much of the city has been built with tourism in mind, so you’ll find whatever you need depending on your budget; from £10 per night small hotels to five-star resorts. Whilst some dream holiday locations require two planes, three boats, and a bike ride from a local, Agadir is readily available with London and Manchester both offering direct flights. Once you land, you’ll be just 12 miles from the city centre which you can reach by bus or taxi. Luckily, taxis are simple in Agadir with a simple fare of £14 (200 dirhams) so there’ll be no nasty surprises when you arrive. 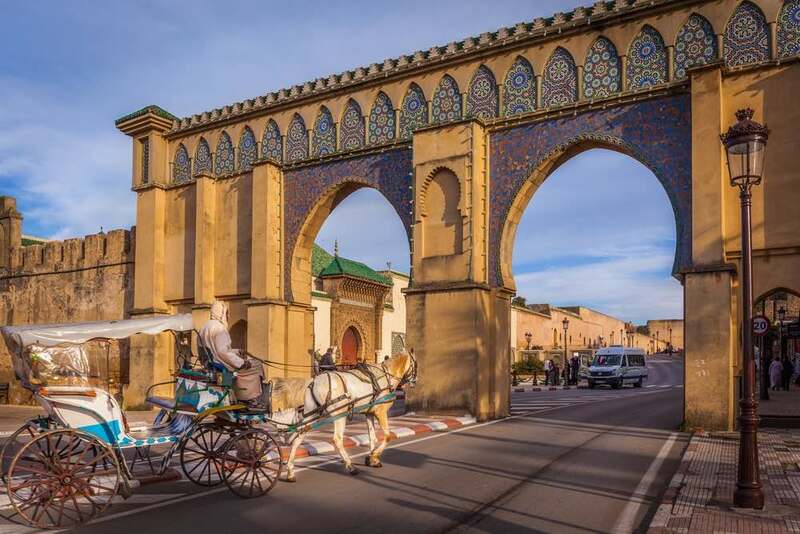 If you happen to be reading this from Marrakech, Ouarzazate, or Essaouira, the roads are well-built in Morocco, so Agadir makes for a great next stop on your travels. Of course, the culture you experience when on a trip is one of the factors that help to create memories. In Morocco, you’ll find a country very proud of their history so we recommend checking the calendar and seeing if you can catch one of the festivals nearby. For example, the Honey Festival each May is held in Argana and celebrates what is thought to be the world’s oldest collective hive. As we enter the summer, stage performances, camel racing, and regional dancing can be enjoyed at the Sahraoui Festival while July sees more camels at the Moussem of Tan Tan. Each year, Tuareg Nomads make their way to Agadir to exchange food and celebrate Morocco. 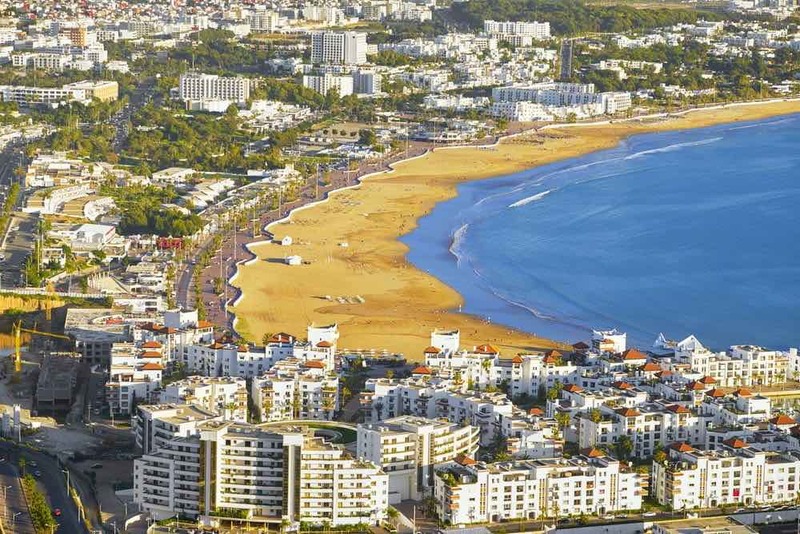 As mentioned, Agadir has the sunshine for most of the year so that beaches will be important to your stay. Fortunately, the city boasts six miles of sandy coastline which is well-visited from people all around the country (and world!). However, there’s something that makes the Agadir beach unique compared to other destinations; width. Since it remains wide all the way along, it’s very rarely crowded to the point where you feel uncomfortable. With this in mind, you can enjoy the sun, play with your family, or even get out into the water with opportunities to surf, wet-bike, and parascend. If you want accommodation on the beach, your options will be vast with some four and five-star hotels lining the sand. What’s more, there’s also a variety of restaurants nearby so you can enjoy the local cuisine as you watch the sun set on yet another stress-free day. 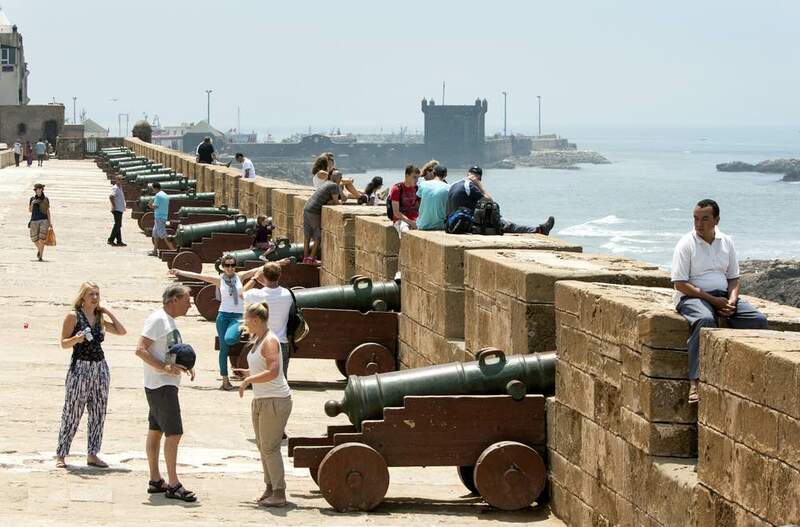 When you think of cycling holidays, places like Amsterdam spring to mind but, if you’re looking for something different, Agadir is a superb alternative. With the spacious streets and many places to explore, your legs will get tired before your will to see all the amazing sights. After hiring a bicycle locally, you could see the Amazigh village or perhaps a Douar to immerse yourself into the Moroccan way of living. Furthermore, just 30 miles away is the Souss-Massa National Park which consists of 33,000 hectares of green land, nature, and wildlife at its finest. If you want to sit and watch the native birds and animals without a care in the world, this is the place to come and cycling is an excellent way to exercise along the way. If you consider yourself to be an experienced cyclist, there are longer trails you can pick up including ones to the High or Anti-Atlas mountains. At times, this trail will be remote and challenging, but the rewards are truly spectacular. As you move between rocky canyons and lush green valleys, the views will create memories to last a lifetime. Although we rarely remember a holiday for good food, we certainly remember a trip with bad food (especially with the consequences of poorly-cooked food). Therefore, this is an important factor to consider and Agadir delivers. Every corner you turn, there’ll be a cafe, market stall, or restaurant waiting depending on how adventurous you want to be. If you want to really treat yourself, the King of Morocco often frequents the Boulevard du 20 Aout. Unfortunately, you’ll never see him eating at another table since the chosen restaurant is closed to visitors when he is in attendance but it shows the quality of food in the area. As you get with most other cities in the world, it also won’t take long before you see popular Western chains operating in and around Agadir. If you like to build your opinions on a city based on the local cuisine, we recommend the Talborjt district. Not only are the prices very reasonable, most locations have multilingual waiters to make you feel comfortable in the unusual surroundings. For all parents, you’ll appreciate the challenge of keeping children entertained while on holiday so you might be worried about Agadir. If so, there is no need since you’ll find zoos full of exotic animals, the long (and wide!) beach, Souss-Massa National Park, plenty of play areas, Bird Valley, and more. If you need to get away from the heat for some time, what better way than to cool down in Atlantica Parc; a huge water park! If you have teenagers or seek the thrill of adrenalin yourself, the golden beach is a dream for all surfers. With some areas of the beach offering 400 metres before hitting the water, it provides an ideal opportunity to launch a kite. With warm water in the summer, you’ll get away with shorts without wanting to get back onto land after ten minutes shaking like a leaf. With the heat difference between the desert and ocean, this creates a constant wind for kite surfing and a suitable place for beginners and experts alike. For those who prefer traditional surfing, the waves are superb for this on the Atlantic coast of Morocco. As a result, it won’t be hard to find somewhere to rent equipment or even take surf lessons if you’re a beginner. Rather than watching others have fun, why not get involved and learn a new skill? With some destinations, the locals are accustomed to the heat which leaves you sweating and struggling to even breathe without help. On the flip side, tourist-friendly Agadir has plenty of hammams to escape the sun and enter a world of bliss. In addition to Turkish baths, many hotels offer massages and a full-body exfoliation for an affordable price. After a long day of sightseeing in the sun, there’s no better way to treat your body than in the hammam. Sticking with the theme of entering a blissful state and forgetting the stresses at home, Agadir provides ample opportunities to do this on a daily basis. Back in the 1960s, the whole city was redesigned with an emphasis on tourism and the beaches we’ve already discussed provide a fantastic starting point. With six miles of sand, you can find a secluded spot and settle for the day. After this, the facilities are wide and varied from spa resorts to golf courses. Depending on your likes/dislikes, you’re sure to find something you and your family can enjoy. If you want to forget about the world and focus only on the present, yoga is a good way to start the holiday to rid your body of stress and worry. So far, we’ve talked a good amount about relaxation and beaches but what if you prefer to get involved in the city hustle and bustle. Well, a small trip inland will bring you to the city and a plethora of stores. From here, you can decide what sort of experience you want from modern to traditional. Starting with the Souk, this is a traditional indoor market that seems to go on endlessly. As you walk through the winding corridors, you’ll find a little bit of everything from hand-dyed fabrics to vegetables and everything in between. For locals and visitors, the market is a great way to spend an afternoon or morning and you might just find some charming items to take back home. Also, feel free to pull out your haggling skills because this is just a part of the culture in Morocco. Unlike other locations where prices are, more often than not, rigidly set, Morocco encourages haggling when buying from a market. After leaving the Souk, you can take a relaxing stroll through Le Medina d’Agadir Cocco Polizzi. With these arches, they were designed in the 1960s by an Italian architect. As you walk through, be sure to pay attention to the outstanding craftsmanship because it pays homage to the way architects have been designing their products for many centuries. 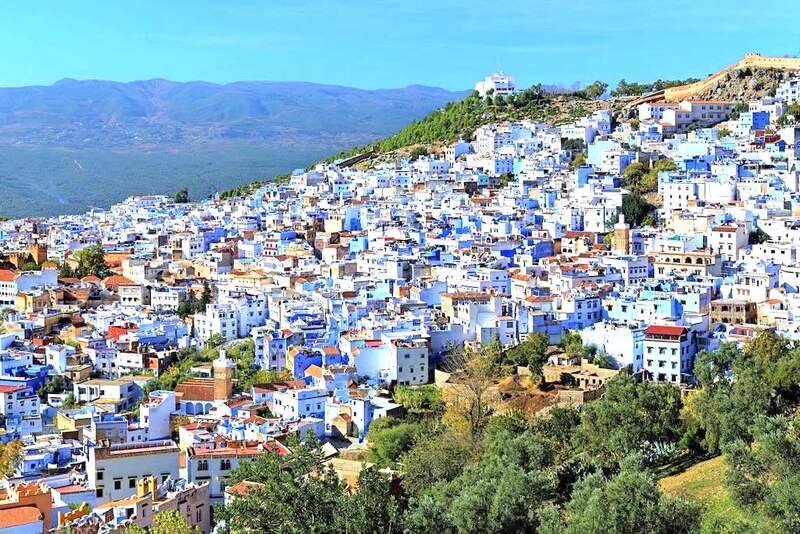 Finally, you might want to lose all technology and realign yourself with the beautiful nature Morocco has to offer. By leaving the city walls, you can either walk, cycle, or drive through some amazing trails. With the Amazigh trek, for example, cacti and argan trees line the walk alongside the shore. If you have a family, there are various family-friendly treks you can take and many are run by the locals who know the area like the back of their hands. If you choose to join a local, not only do you get the beautiful views but you also learn about the history of the area which can be fun for the little ones. If nothing else, you can get your new Facebook profile picture! There we have it, everything you need to know about Agadir in Morocco. If you’re looking for your next escape destination, Agadir is certain to bring relaxation, plenty of cultures, and, best of all, memories with those you love!